This fear nearly debilitated me at the beginning of my writing journey. In fact, I still experience flare-ups. I had no idea where to begin to get clients … I had two degrees in classical music performance and zero marketing training and experience. Many of you tell me that you share my uncertainty and occasional sheer unadulterated panic about selling my writing services. I look back in gratitude to a few helpful writers who gave me some tips when I started out. And although I’m still very much a work in progress, I want to pay it forward. Particularly because I want to see more good writers in ministry and nonprofit content writing space. If I can sell my services, so can you. Hence these 6 writing tips for starting out as a freelancer who wants to get clients. Here’s the great news: the fear of selling your writing services is just a roadblock, not an impenetrable barrier. And one thing we know about blocks in a road is that you can get over, across, and around them. The best way is one step at a time. In other words, take on and overcome these “fear-and-uncertainty” bad boys by completing some practical tasks. Tasks are tangible. You can do one and then undertake another. And another. And soon you can look back and see roadblocks are behind you. That’s why I’ve framed these 6 writing tips for starting out as tasks. I’ve listed them in logical order but you can complete them in any sequence, simultaneously, quickly, or one at a time. It doesn’t matter how you do it. Just get going. Clips are samples of your writing. Potential clients and publishers need to see that you can write. Your clips show that you can. Even if you’re just starting out, you have writing samples and you may not even know it … just take a peek in your computer files. Once you’ve got a few clips, you have a good idea of what topics interest you and what kinds of writing projects appeal to you most. Choosing a niche allows you to focus your prospecting and prevent overwhelm. What industries, businesses, or hobbies appeal to you? What kinds of content have you written already? Make a list. Whatever niche you start out in need not be permanent. It’s simply a launch pad. For instance, I spent 25 years as a classical musician before turning to writing as a second career. I followed the advice of gurus everywhere to “Write what you know” and leveraged my experience to get some of my first clients – music companies – until writing for ministries and nonprofits consumed my passion and my time. More tips for choosing a niche. You need a website But you don’t need to start out with 30 pages. You don’t need to have all the bells and whistles. You just need a website. As to what you’ll put on those pages – well, you’re a writer, right? Here’s a quick guide that will help you figure out what pages to write and how to make a plan to add additional site content. Write a one-page letter template to send to prospects in your niche. You'll personalize it over and over. This sales letter should follow the standard 6-part letter writing format and offer the reader a simple but value lead magnet (see #5). You’ll include a postcard as a response device in your print version and a link to your lead magnet download in the email version. The purpose of the letter is not to get the reader to hire you. If he does, great. But that’s not the point. Your call to action in this letter will invite the reader to respond to you by returning the postcard you will enclose in the letter so he can receive the lead magnet – a special report that meets one of his needs. And your postcard will allow you to capture your reader’s mailing address, phone number, and email address. By returning the postcard, the reader tells you he is interested in what you have to offer. That’s why you need to create a compelling lead magnet. What are the pain points of the people in your niche? Write a piece of free content – a “lead magnet” – that offers valuable information to meet one of those needs. Your lead magnet could be an article, white paper, report, eBook, tip sheet, checklist, or guide. There are people who want to hire you to write for them, but they are not quite ready for your services. For instance, a prospect receives your lead magnet in April – right about the time she is busy planning summer events. But September rolls around and she realizes she needs to send out a year-end campaign. Five months is a long time to remember the name of a content writer … unless that writer continued to stay in front of that prospect and feed her lots of wonderful, free information regularly and dependably. That’s one reason you must have an email list. Or what about this scenario: your freelance client work keeps you busy while you write your first book. You flip over the calendar and notice your book release date is a month away. But you’ve built an email list and nurtured those readers with regular content. When you announce your book release in your newsletter, you get plenty of advance sales and reviews. Here’s an important note: it’s not enough to simply gather up email addresses in a nice list, although that’s a start. Where do you collect all of these email addresses? Not in your personal Google or Outlook account. You need to register for an email marketing service. I use Constant Contact and I love it. And you must begin to communicate regularly with those readers and provide them with good information. What can your share with those in your niche that is of utmost importance to them? Give them this information. They will read your emails. And they will send freelance work your way.Do a good job and you’ll find they even pay you to write their emails! Create and send helpful, high-quality emails regularly. 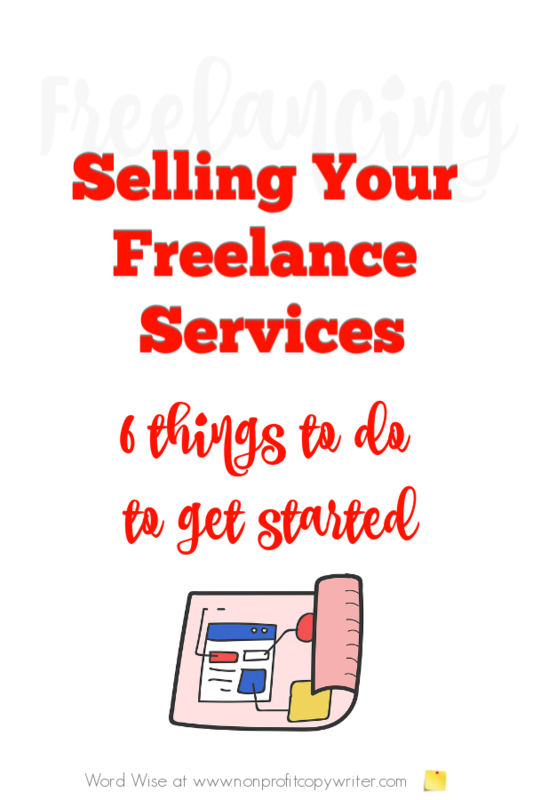 How do you start selling your services as a freelance writer? The same way you eat an elephant. One bite at a time. What is the next task you will complete to get started in your freelance writing journey?